A deep fried conical pastry stuffed with spiced potatoes and peas. Vegetables cooked in chickpea flour batter and deep fried. Sliced onion marinated with lemon juice and spices, battered in chickpea flour and deep fried. Well known mixed vegetables and paneer tikka topped with cashew. 2 x Samosa, Onion Bhaji and Vegetable Pakoras. Combined the soy sauce, red chilli powder, vinegar, garlic and green chillies. Beef cooked in a special way with special Masala. Chunks of beef cooked in thick curry sauce. Beef cooked in a puree of spinach and mildly spiced sauce. Tender pieces of beef cooked in a rich creamy sauce of almonds and cashew nuts. Diced beef cooked in a coconut flavoured and lightly spiced sauce. A traditional Indian curry. Taste of India special recipe. Handi Chicken recipe is a very traditional restaurant style. Grind corriander seeds and whole red chillies into a coarse powder. Boneless chicken cooked in lightly spiced flavoured sauce and diced fried onions. Boneless chicken cooked in a rich creamy sauce of cashew nuts and onions and have added eggs. Boneless chicken cooked with onion and special spices in a creamy tomato sauce. A chilli hot dish from Goa which we recommended for the adventurous. Boneless chicken pieces cooked in a rich creamy sauce of almonds and cashew nuts. Chicken cooked with curry leaves, coconut milk and tomatoes. A tangy flavoured chicken dish with chunks of capsicum, tomatoes, onions and garnished with cheese. Delicacy of barbecued bone and boneless chicken cooked in a creamy tomato sauce. Chunks of lamb cooked in a thick curry suace. A tangy flavoured lamb dish with chunks of capsicum, tomatoes, onions and garnished with cheese. Lamb cooked in a puree of spinach blended with our own herbs and spices. Tender pieces of lamb cooked in a rich creamy sauce of almonds and cashew nuts. Cooked in a tomato and coconut sauce. Medium to hot curry. A dish which is hot in flavour predominantly fenugreek and corinader. 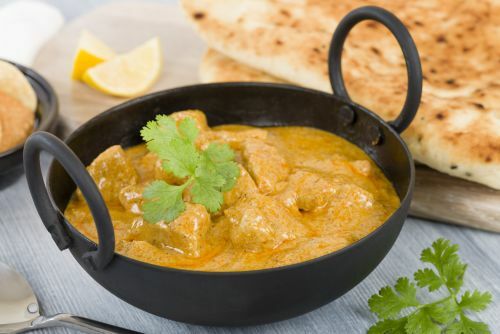 A traditonal Indian curry. Taste of India special recipe. Prawns cooked with sauteed onions, capsicums, tomatoes and coconut milk. Taste of India special recipe. A delightful combination of prawns cooked in a puree of spinach with our own herbs and spices. Scallops cooked in a smooth tomato sauce. Lentils simmered on fire overnight and cooked with onion, garlic and ginger. Fresh mixed vegetables cooked in a creamy gravy of cashew nuts and almonds. Cottage cheese, onion and capsicum seasoned with spices and cooked in onion gravy. Cottage cheese and green peas cooked in fenugreek and flavoured gravy laced with cream. Whole lentils simmered on a slow fire overnight with onion, ginger and garlic. Potatoes and peas cooked together in a subtly spiced gravy. Veggie kofta balls cooked in lightly spiced sauce. Chickpeas cooked with onion, tomato, garlic, ginger and lightly spiced. Seasonal vegetable cooked with capsicum, tomatoes, onion and garnished with cheese. Minced lamb blended with chef's own herbs, skewered and roasted in the tandoor. Drumsticks chicken marinated in yoghurt, ginger, garlic, spice and smoke roasted. Chicken marinated in yoghurt and flavoured with spices and herbs. Cubes of chicken marinated in paprika, yoghurt and smoke roasted. Marinated in a combination of chef's special spices and then roasted to perfection. Chunks of paneer marinated in spices and grilled in the tandoor. Prawns marinated in yoghurt with ginger, garlic and smoke roasted. 2 x Garlic Kebab, 2 x Malai Kebab, 2 x Chicken Tikka, 2 x Tandoori Chicken and 2 x Lamb Seekh Kebab. Paneer sauteed with onion, garlic and ginger with soya sauce. Chicken sauteed with onion, garlic and ginger with soya sauce. Beef sauteed with onion, garlic and ginger. Prawns sauteed with onion, garlic and ginger with soya sauce. Taste of India special flavour. Rice, chicken, egg and soy sauce. Add and stir to combine. Taste of India special recipe. Medium to hot. Combination of Taste of India different sauce. Seasonal garden fresh vegetables cooked with rice, herbs and spices. Chicken cooked with spices in rice and flavoured with saffron. Lamb cooked with spices in rice and flavoured with spices. Beef cooked with spices in rice and flavoured with spices. Goat cooked with spices in rice and flavoured with spices. Prawns cooked in our special way and blended with saffron flavoured with rice. Very unfair to disclose. If I do, Chef is going to kill me. Plain leavened bread cooked in the tandoor. Garlic stuffed bread cooked in the tandoor. Cheese stuffed bread cooked in the tandoor. Bread stuffed with seasonal vegetables. 1 x Plain Naan, 1 x Butter Naan, 1 x Garlic Naan, 1 x Cheese Naan and 1 x Peshawari Naan.